This is quintessential Switzerland: green hillsides spotted with cows and chalets spread beneath glacier covered summits. The Jungfrau Region includes three of the Swiss Alps most famous locations; Lauterbrunnen, Grindelwald and Interlaken, all within sight of the towering mountain trio of Eiger, Mönch and Jungfrau. Interlaken alone has three mountains rising from town that offer up to 1600 meters of uninterrupted gain. From Lauterbrunnen, arguably one the Alps most scenic valleys with its abundant waterfalls cascading from steep cliffs, wild trails are still to be found that stretch well into wild alpine terrain. And Grindelwald, has an arena of trails within sight, or even alongside, glaciers and the famous Eiger north face. 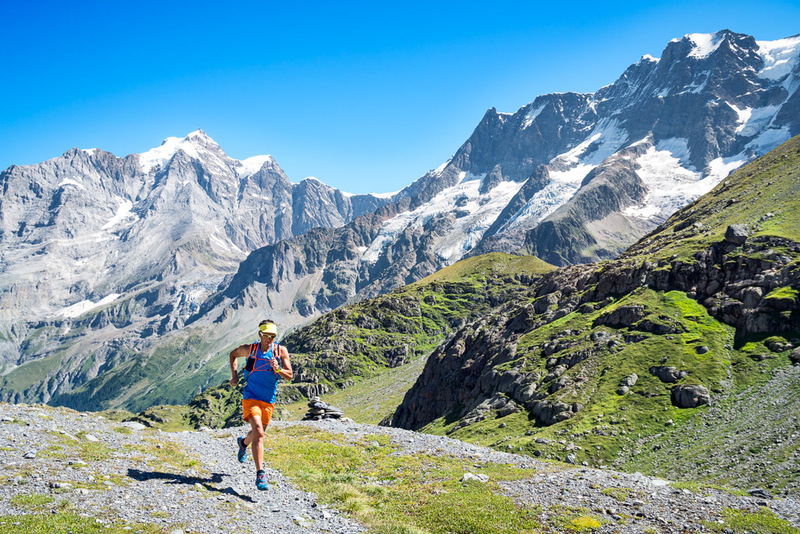 The region also hosts two of the Alps most famous, and certainly most beautiful, races; the Jungfrau Marathon and Eiger Ultra Trail. Lacing though the mountains and valleys is a trail network that will keep any runner’s to do list long and varied. From cruiser trails on grassy hillsides to relentlessly steep, 1600 meter climbs to ridges with views of 4000 meter peaks and glaciers, the Jungfrau Region has it all. There's a lifetime of trail running here and these six runs are merely a sampling of that endless possibility. 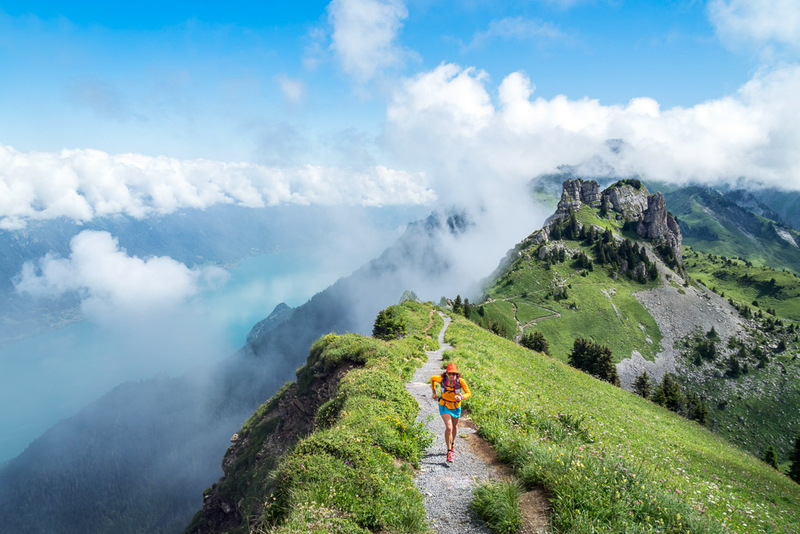 These are a few of our favorite trails in Switzerland's Jungfrau Region (aka... the big backyard)! The Hardergrat has become a classic, and for good reason. Of its 35km, about 18km are spent on a sharply defined ridge, with significant, even airy, drops on both sides, in fact... 1500 meters of drop. It’s not just a trail, it’s a journey. Lauterbrunnen Valley is unarguably one of Switzerland's masterpieces. On each side of the valley sit the car free villages of Mürren and Wengen, and also the tiny village of Gimmelwald. In the back of the valley, starting from the town of Stechelberg, is a loop requiring a bit more time and commitment that's ideal for trail runners. It's never difficult, mostly runnable singletrack, and always scenic. 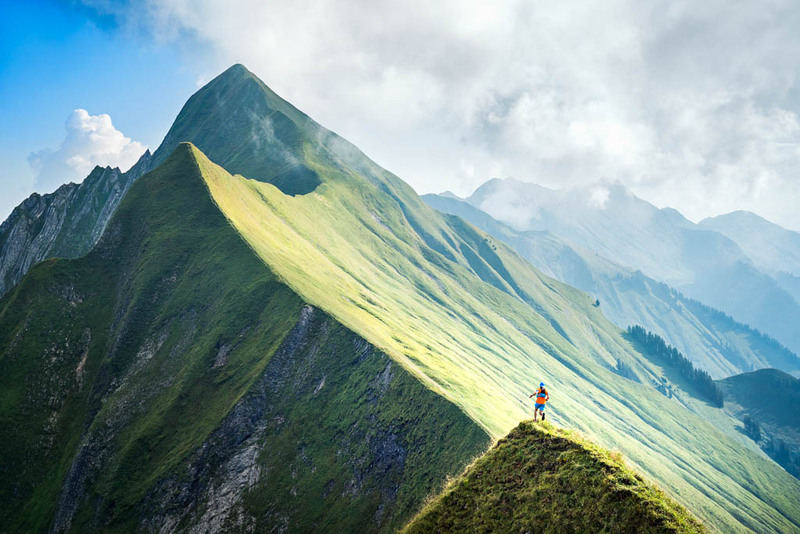 This is Sound of Music stuff, and a trail that should top your "Must see to believe" list. If there is one run to do in the Berner Oberland, this is a leading candidate. As you start upward from Wilderswil for Schynige Platte, something more than a journey kicks off, a kind of trail running odyssey begins. A steep forest climb, a rolling traverse to Grosse Scheidegg, and massive views of the region's massifs. This run connects some of the Jungfrau region's most beautiful, and most popular sites. From the waterfall-lined valley itself, up to car-free Wengen, beneath the Eiger, Mönch and Jungfrau, and up the moraine which serves as the final climb of the Jungfrau Marathon before arriving at the Eigergletscher, and and joining the Eiger Ultra course route to pass the world's most infamous alpine north wall, the Eiger Nordwand, and cruising along flowing singletrack down to Grindelwald. Heading up the trail from Lauterbrunnen Valley to the Schilthorn, or Piz Gloria, you have no less than 2000 meters of climbing ahead. That's plenty of time to settle in and enjoy the solitude before dodging through the busy top station, and plenty of time to take in the impressive views of the Jungfrau Region. Lobhörner Loop || Before you run the Hardrgrat, try this shorter ridge that we're calling the "Startergrat"
From Lauterbrunnen a quick lift ride gets you to Grütschalp. While not always on official trails, this run takes you deep into the Soustal, around the Lobhörner, and across the ridge of the Sulegg where you drop cross country to meet the trail to the Lobhorn hut for a piece of Switzerland's best Haslikuchen.